The Voltsaf portable battery is a high-capacity portable battery that’s ready to fully charge larger devices, such as tablets or to recharge smartphones and other smaller devices multiple times. Although provides high capacity, it’s also one of the smallest devices of its capacity that we’ve reviewed. 12,000 milli-amp hours (mAh) capacity, enough to recharge an iPhone 5S (2,440 mAh) about five times or fully recharge an iPad 3 (11,666 mAh) about once. (All portable batteries lose some electricity when charging, so you won’t quite get a full charge for the iPad 3.) That makes the Minzos great for anyone who needs their devices to keep working even when there’s no wall electrical socket available. Two USB ports so it can charge two devices at the same time. One port provides 2.1-amp power, so it can charge recent Apple and Android devices at their maximum speed – helping you get that charge cord disconnected as soon as possible. The other port provides standard 1.0-amp USB speeds, allowing you to charge a secondary device without having to wait for your primary device to finish. 5.4 inches tall by 2.3 inches wide by 0.8 inches thick – making this without a doubt the smallest 12,000-mAh portable battery we’ve reviewed. It’s amazing Minzos has packed as much power as in iPad 3 into a battery the size of an iPhone 5. The Voltsaf weighs 8.7 ounces – double the weight of an iPhone 5S, but the same weight as other batteries we’ve reviewed with the same capacity from Anker, Jackery, and EasyAcc. 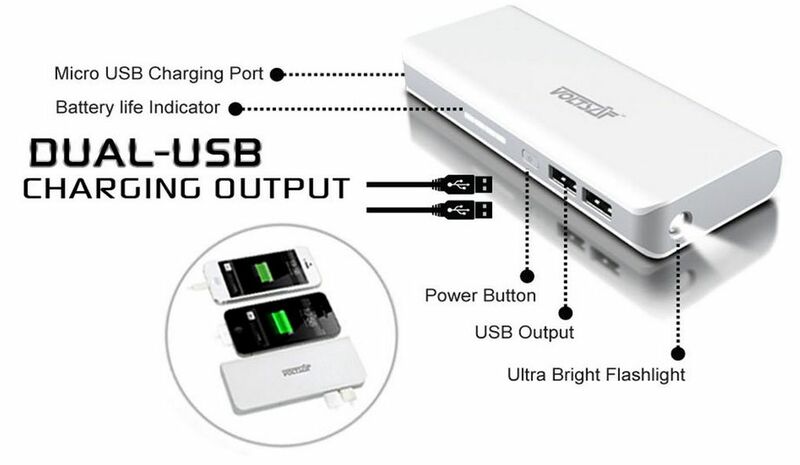 The Voltsaf recharges from a standard USB port, but unlike every other similar battery we’ve reviewed, Minzos provides a free wall charger. If you buy a similar product from New Trent, Innergie, or another manufacturer, you’d either have to provide your own wall charger or use your laptop. 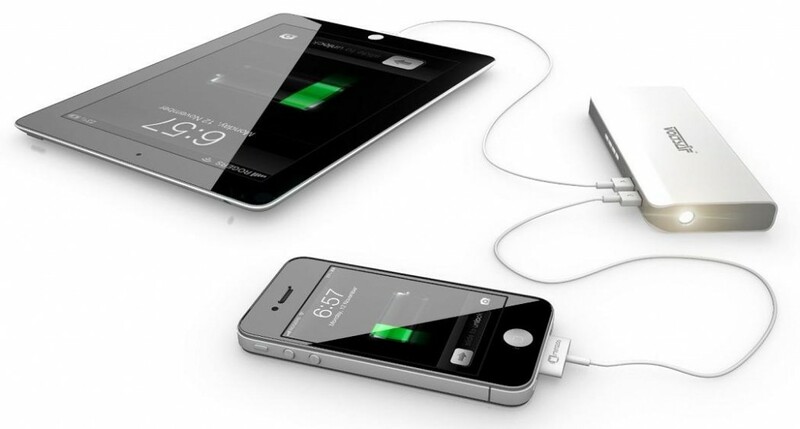 They also provide a micro-USB charge cord, and the Voltsaf itself has a bright built-in flashlight. This is definitely a premium portable battery – the kind that not only looks good but also makes sure you have everything you need. With two ports, fast charging, and high capacity in a very small package, this is an excellent battery for anyone who needs power on the go. Although the Voltsaf has top features in almost everything else, it does have a slow charge speed for itself – only 1.0 amps. Since the Voltsaf holds 12,000 milli-amps, it will take about 12 hours to fully charge from empty. If you need a high-capacity device which charges much quicker, look at the Pro-series from Anker or the Ultra 16000 from EasyAcc with their special wall chargers. Yes. Besides some Jackery products, the Voltsaf is one of the only batteries we’ve seen that support pass-through charging. For typical users, that means you can connect your phone to your Voltsaf and your Voltsaf to a wall charger, go to bed, and wake up to find them both fully charged. For users of devices like the Raspberry Pi (RPi), that means you can use the Voltsaf as a battery backup – connect your RPi to the Voltsaf and the Voltsaf to the wall. In that case, if the power goes out in your house, the RPi will keep working for several hours until the battery drains. Note: Minzos has not rated the Voltsaf for continuous use with devices like the Raspberry Pi, so this could wear out the battery faster than expected. 500 full recharges. That means, if you fully drain the Voltsaf while charging up your device, you can do that 500 times before the battery is statistically likely to fail. However, if you only drain it half way, you should get about 1,000 charges. This is the industry standard for lithium-ion/lithium-ion-polymer batteries, and it’s exactly what we’ve seen in all our reviews. The battery is also rated to last for three years at 80% capacity, which means that after three years it should still hold about 9,600 mAh when fully charged. This is also fairly typical of current-generation batteries (even the batteries built into your devices). 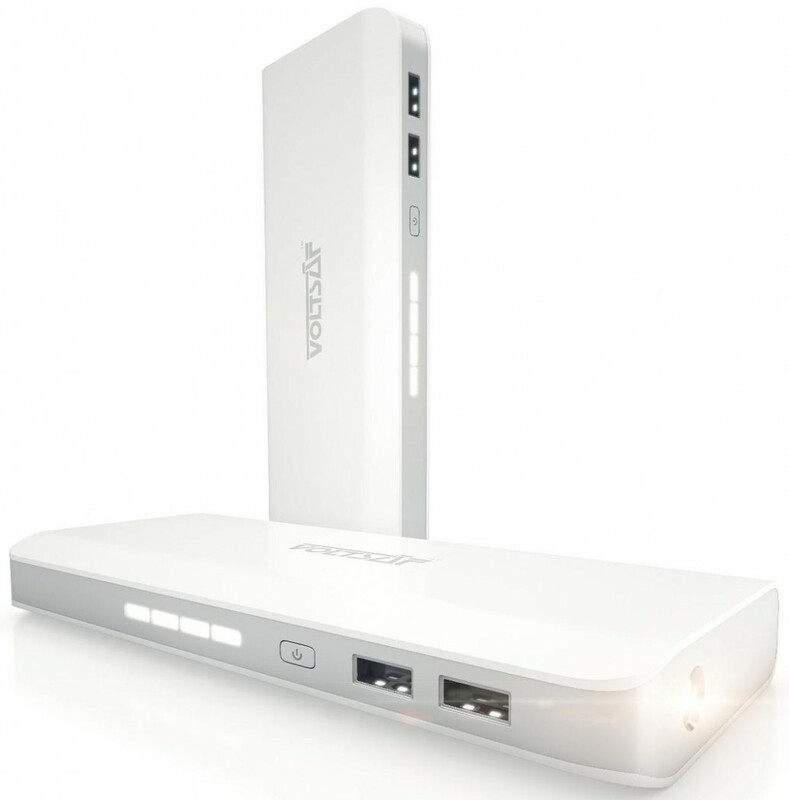 Although Minzos only currently produces a single battery, the Voltsaf is a leader in its class of 12,000-mAh batteries. We can only hope that Minzos will consider producing additional classes of compact and high-quality batteries in the future.